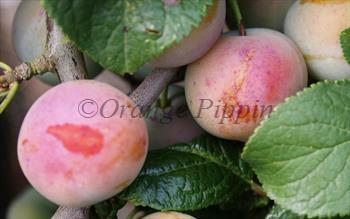 Shepherds Bullace is a traditional English bullace - effectively a type of damson. The fruits have an extremely sharp flavour and are ideal for cooking with. The flavour sweetens after hard frosts. Cropping is usually very good and the tree is tough and reliable. Please fill in the details below and we will let you know when Shepherds Bullace damson trees are back in stock. Shepherds Bullace is in flowering group 3. Shepherds Bullace is self-fertile and does not need a pollination partner, although fruiting may be improved if there is a compatible tree of a different variety nearby. Since it flowers in the middle of the blossom season it can be pollinated by most other damson trees. Shepherds Bullace is easy to grow, and needs little pruning.